I'm not entirely sure how to articulate this, but biking home from metalsmithing in the freezing cold last night made me feel fantastically alive. 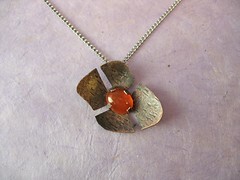 I'm learning more and more metalsmithing techniques and concepts and gaining confidence in my abilities to execute them; I'm making things that I see as a fusion of the metalsmithing world and the assembly jewelry I was working on before; watching copper glow bright red from my torch and shift on the flowing solder is a pure, elemental rush. Likewise, I'm immensely proud of myself for bicycling in such extreme cold, and surprised and delighted at the muscles that can suddenly Do The Right Thing when I want them to. 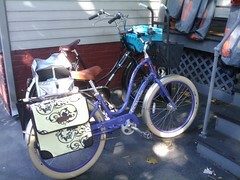 After only walking and taking public transit for so long, a bike really gives me a new feeling of freedom-of-place. And it's fun to go so fast! I know that at some point my rate of metals-related learning will stop accelerating, my bicycling-related fitness improvements will plateau. But I hope that I'll retain the feeling of hungrily racing forwards, able to smoothly and competently go wherever I can imagine. (Mostly) successful time at Arisia!